Apple Leaking Like A Faucet? Apparently, though, Apple has sprung the motherload of leaks. Unbelievably, a stream of renditions of rumored Apple products is starting to appear. This image is reportedly of Apple‚Äôs upcoming update to its iMac line. The new iMac, code name Grundlepins, appears to have roughly the same configuration as current iMacs. According to sources, though, the updated iMacs will have larger hard drives and more memory than current models. Apple doesn’t comment on unreleased products. If you find any more of these leaked images, let us know in the comments. Why do you Mac freaks wet your pants every time some stupid news dribbles out of Apple? Give it up and get a PC. Anyone with half an imagination and the drawing ability of a five-year-old could have conjured up those drawings. I mean really. 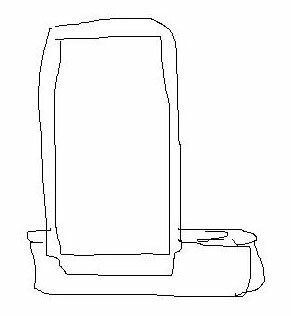 The iPhone dock drawing looks like what you’d expect the dock to look like. If the dock ends up looking even remotely like the drawing, the “artist” could claim a coup. Roughly? Jeez, it couldn’t possibly be any more like the present model. So … big freaking deal! Oh … and JOrge? I’ve got five words for you: “malware,” “spyware,” “viruses,” “worms” and “Vista.” Never had ’em. Haven’t you been reading the news lately? Macs have just as many problems with viruses as PCs. Don’t wet your pants, though, you still have lame mac rumors to freak out about. Jokes on you PeeCee geeks. When it all boils down – the PC and the legions who follow Billy Goates simply have zero imagination, talent or sense of humor. No wonder you can’t get laid. You can’t even ‘get it’ from a silly article. The best part is – being a ‘PC Insider’ on the weekends – I get to hear all the juicy reasons why PC’s are so great – because they require more sales of absolutely stupid products like the “Vista USB Cable’ for transferring your old files to your new PC. Why would anyone need this? Answer: because if they’re dumb enough to buy Vista, they’re dumb enough to pay $39.00 for a USB cable. Newsflash to PC Geeks – you can’t upgrade to Vista and enjoy all the MacOSX features without upgrading your PC. Thank you, Goodnight. I agree that these drawings are a bit lame. Why not wait until there is more information before hitting the streets with it. Oh, and J0rge, I’ve had a PC since way back in the DOS days all the way through XP. I’ve also had Linux machines since those first days when you loaded it with 26 floppies. Not to mention that I’ve been in the software business for over 20 years, mostly Unix. Currently, IMHO, my Mac Book Pro beats any computer I have ever owned or used in all areas that I use a computer for. That makes me interested in any news from Apple. My question to you is, why do you wet your pants every time there is a Mac story? Really, How old are you? 12?